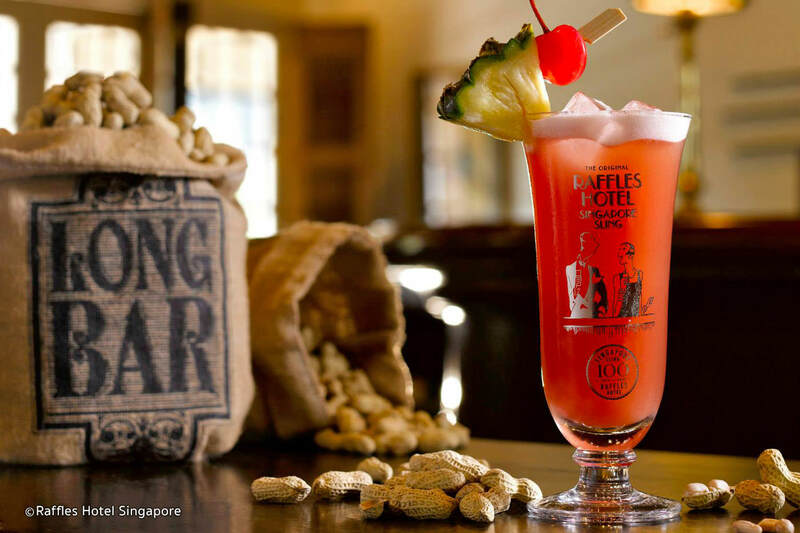 Brightening up a cold winter's evening with a taste of the glamour of the Long Bar at Singapore’s Raffles Hotel, the iconic Singapore Sling is a delight. Created in 1915 at the Raffles Hotel by Hainanese bartender Ngiam Tong Boon, the sling is a rosy tinted gin based cocktail. The story goes that at this time it wasn’t considered seemly for ladies to be seen drinking hard liquor in public, instead they were encouraged to drink tea or fruit juice. Perhaps at the behest of a particularly persuasive lady or maybe spotting a gap in the market, Ngiam created the sling to look like a fruit juice and thus allow ladies to imbibe in propriety. It was, of course, an instant hit. 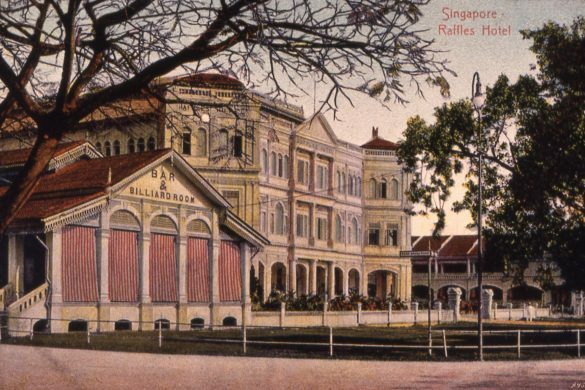 Famous for its colonial glamour and history, Raffles in 1915 Singapore was the much loved and patronised gathering place for the expat circle. Traders, plantation owners, officers, diplomats and socialites convened in the shade at the Long Bar to while away warm and humid afternoons and evenings, sipping cool drinks away from the mutinies, skirmishes and general stresses of doing business in a far flung corner of Asia. 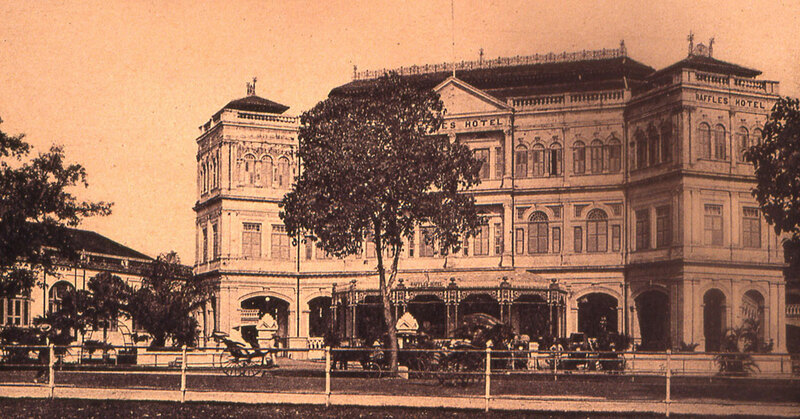 First estabished as a 10 roomed beach house hotel in 1887 by Armenian hoteliers the Sarkies Brothers, the Raffles Hotel was named after Sir Thomas Stamford Raffles, the founder of Singapore. Its excellent reputation for high standards of service and accommodations ensured that it was hugely popular with a wealthy clientele, and just over 10 years later the hotel had expanded to 75 rooms. Ballrooms, dining rooms, verandas and a main building in place of the original beach house were added over the years and by 1899 the Raffles Hotel was a sprawling colonial masterpiece and, by the standards if the time, state of the art. The 30s saw the hotel go bankrupt, while WWII brought an occupation by the Japanese. It is documented that the Japanese soldiers, on walking in to the hotel, encountered guests dancing a final waltz, while the staff buried the hotel's silverware in the Palm Court. At present the hotel is closed for refurbishment but will open again later in 2018. If you ever find yourself in Singapore, a Singapore Sling at the Long Bar or in the Palm Court is an absolute must. For now though, we leave you with the recipe. Like all cocktails the Singapore Sling has changed and developed over the decades, however this particular version is our favourite. Combine all ingredients except soda water and bitters in an ice-filled glass. Top with soda water, stir briefly, dash with Angostura bitters and pop the garnish in on top.